I am generally interested in the community assembly of host-associated microbial symbionts, and how microbial symbionts affect larger ecological processes through nutrient cycling. My research aims to characterize the symbiosis between microbes and giant canopy-forming kelps in Washington state, as well as understand the role that the kelp microbiome plays in coastal nutrient cycling and productivity. I am also using the unique evisceration and regeneration capacity of sea cucumbers as a novel system to study the colonization and succession of the gut microbiome in Woods Hole, MA. Two species of kelp in the Pacific Northwest, Nereocystis luetkeana and Macrocystis pyrifera, play a vital role as the canopy-forming primary producers in kelp forest ecosystems. Microorganisms that live in biofilms on kelp surfaces may affect the development, disease susceptibility, and nutrient acquisition of their kelp host, yet the identity and functional role of these microbial communities on kelps are largely unknown. Kelps release vast quantities of dissolved organic carbon, which might provide a carbon source for heterotrophic microbes living on their surfaces. In turn, microbial metabolisms involving nitrogen may affect the availability of essential nutrients to the kelp. I will investigate the role of the kelp microbiome in nutrient cycling and productivity in the kelp forests of coastal Washington. In 2017 I was awarded a National Geographic Early Career Grant to study kelp forests in the Pacific Northwest... more updates coming soon! Most sea cucumbers are deposit feeders, consuming bacteria and organic matter in the sediment. Some of the bacteria that pass through the gut may evade consumption and become symbionts in the sea cucumber foregut. Sea cucumbers have the remarkable ability to eviscerate most of their internal organs, including the digestive tract. After the expulsion of internal organs, sea cucumbers regenerate their lost viscera. With funding from the American Museum of Natural History's Lerner-Gray Grants for Marine Research, I will use the unique evisceration and regeneration capacity of holothurians as a novel system to study colonization and succession of the gut microbiome. This work will be carried out at the Marine Biological Lab in Woods Hole, MA. Microbial symbionts in sponges are ubiquitous, forming complex and host-specific communities that can contain thousands of unique microbial taxa. For my Master's thesis, I studied the marine sponge Hymeniacidon heliophila, which lives in the intertidal zone in coastal North Carolina. To investigate how tidal exposure shapes the microbial symbiont communities of H. heliophila, I characterized the microbiome of intertidal and subtidal sponges using next-generation sequencing of 16S rRNA genes. After finding that microbial communities were distinct in intertidal and subtidal sponges, I conducted a reciprocal transplant experiment to examine how moving sponges between intertidal and subtidal environment changed in their microbiomes. Additionally, I examined the functional role of microbial symbionts by identifying nitrogen cycling genes in the sponge holobiont. I am studying how invertebrate grazers alter algal community composition in streams, and how this influences rates of nitrogen fixation. 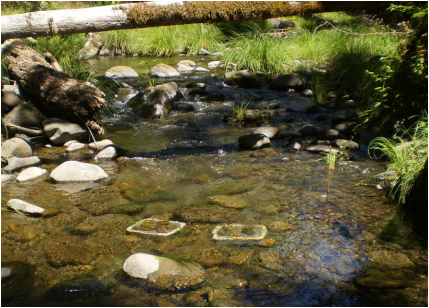 This study was conducted in three different streams along a gradient of drainage areas within the Eel River watershed in Mendocino County, California. After manipulating the presence of grazers on periphyton-covered rocks, we measured rates of nitrogen fixation using the acetylene reduction assay. The effect of grazers on nitrogen fixation was most pronounced in the largest of the three streams. By increasing the proportion and biomass of cyanobacteria, grazing increased rates of nitrogen fixation relative to the un-grazed treatments.